Newbattle Gardens is located just north of Newbattle Abbey in the Eskbank area of Dalkeith and is a small housing estate of large brick built detached houses. Number 19 sits on a corner site with woodland along the southern boundary. 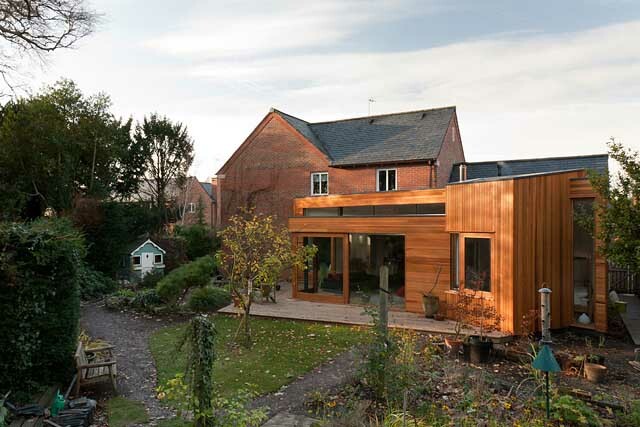 The existing house sits at the right angle of a triangular plot, which means that the property has two large separate back gardens connected at the pinch point of the site. The main garden is a well kept lawn and is accessed from the main rooms of the house. The other garden was more isolated and set over to the pond, vegetable patches and the greenhouses. Internally, the existing house had five bedrooms and downstairs there was a large living room with a L shaped open plan kitchen / dining / family / playroom and a small utility room. 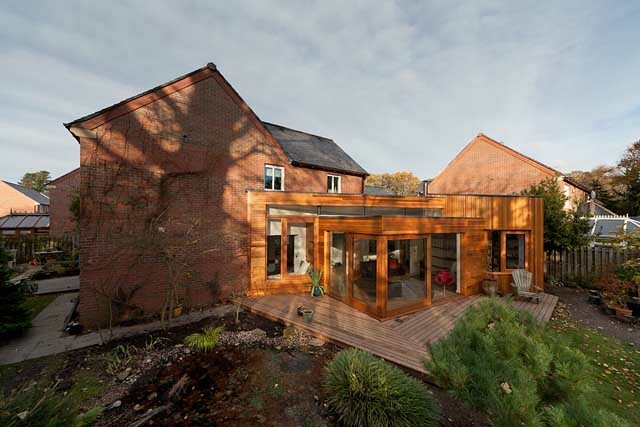 The existing double garage had already been converted into a gym / workshop. 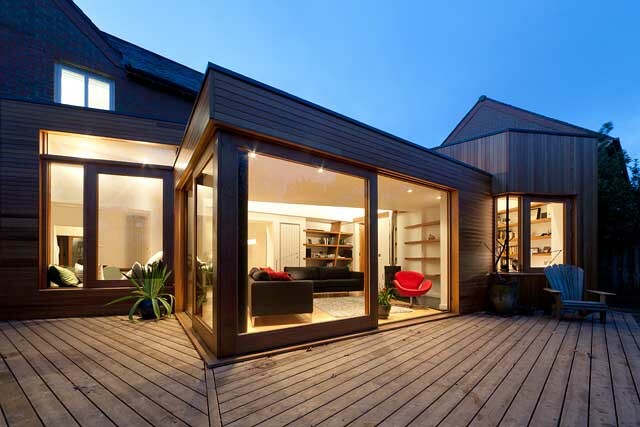 The clients’ brief was to design an extension with a new garden room that connected the main kitchen / family room to the garden. Also part of the brief was a new shower room, study area, utility room and a ‘bay window’ located off the existing family room. At first, it was also to double as a guest bedroom but as the designs developed the bedroom became a separate room. 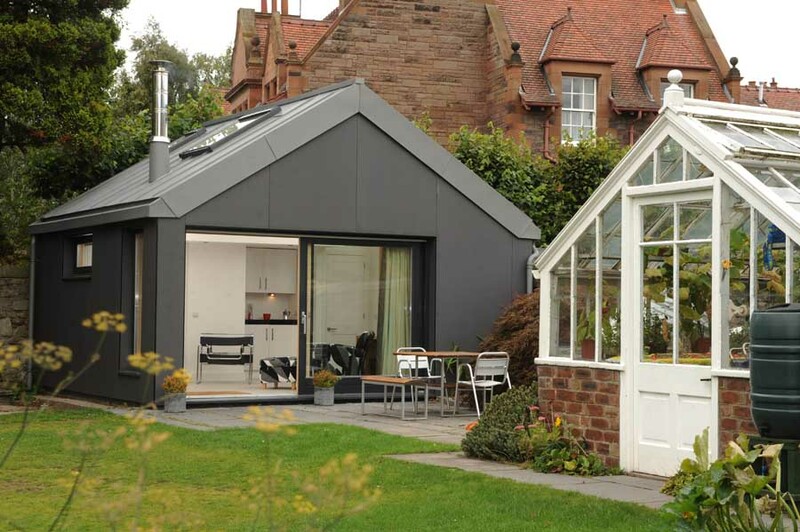 In the original plan the four separate elements, garden room, bedroom, study area and bay window, looked disjointed when elevated and the aim was to create an extension that integrated all four and brought them together as a cohesive whole. 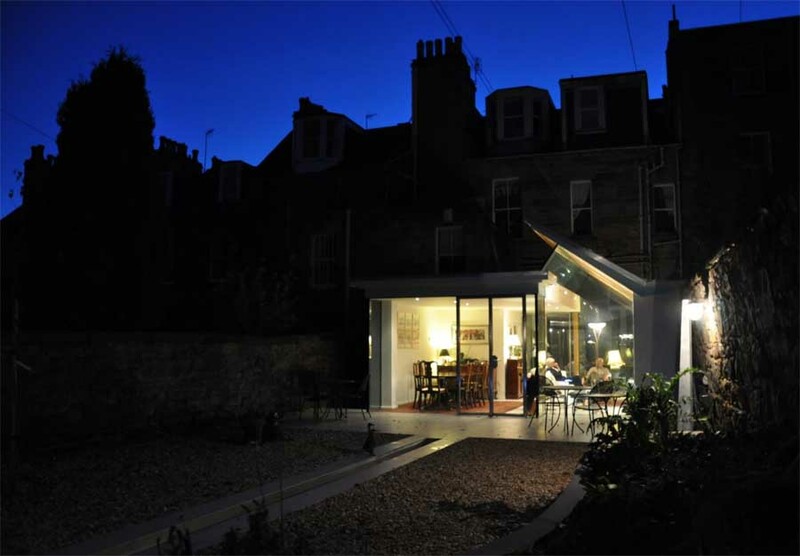 The triangular form that connects the bay window to the bedroom creates the main back bone of the extension. 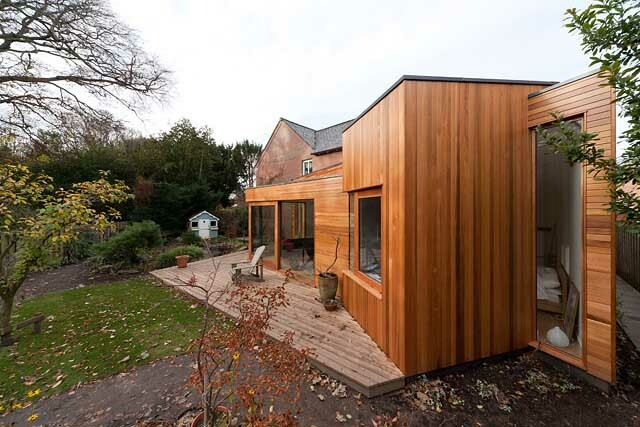 The garden room then slots in below to create the clerestorey and is rotated slightly towards a favourite beech tree while the study ‘box’ sits on top of both. This in turn created an extension that suited the client’s desire for something a little more adventurous than the standard box. 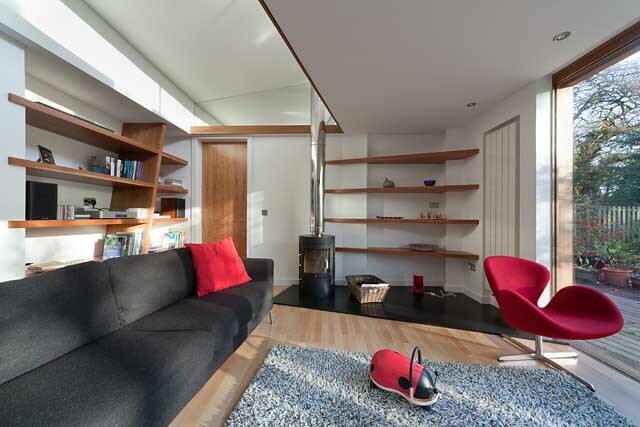 Internally, the interconnecting volumes are further expressed by angles in the hearth, shelves and the ceiling, which all adds to the drama of the split volume spaces. 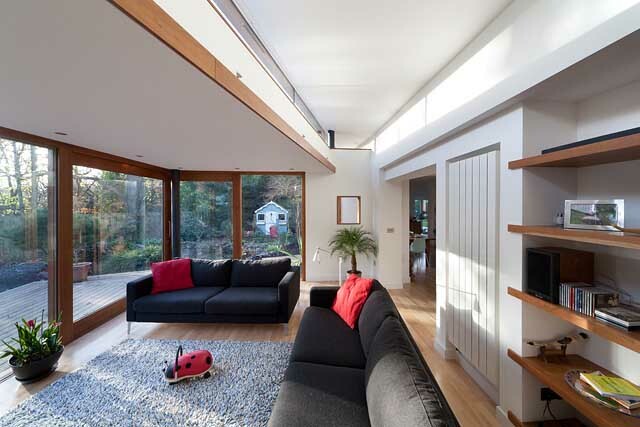 The large glazed window to the bay window maintains the natural light to the existing rooms within the house and the high level clerestorey maintains natural light deep into the back of the extension. 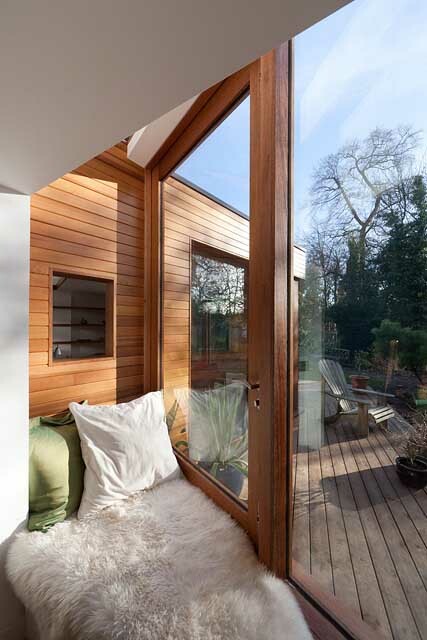 Large glazed sliding doors open the garden room out onto a new deck and brings the garden into the house. The hearth is finished in slate with a wood burning stove and the shelves and detailing are finished in cherry. 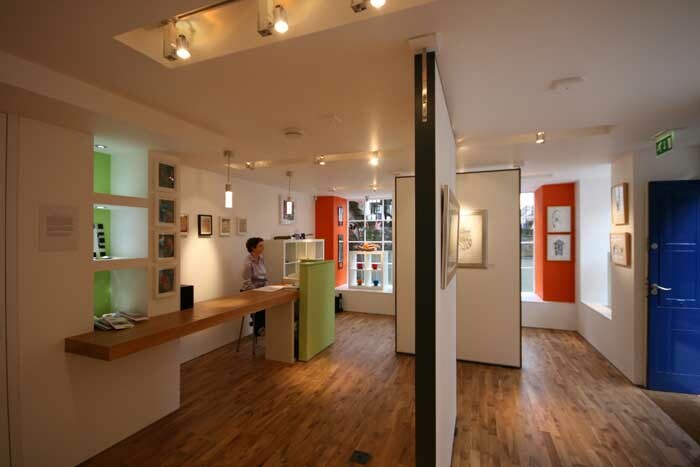 The flooring is beech to match the existing. The existing utility room was taken down to create the access through to the garden room. The ensuite and new utility room were redesigned in the workshop. 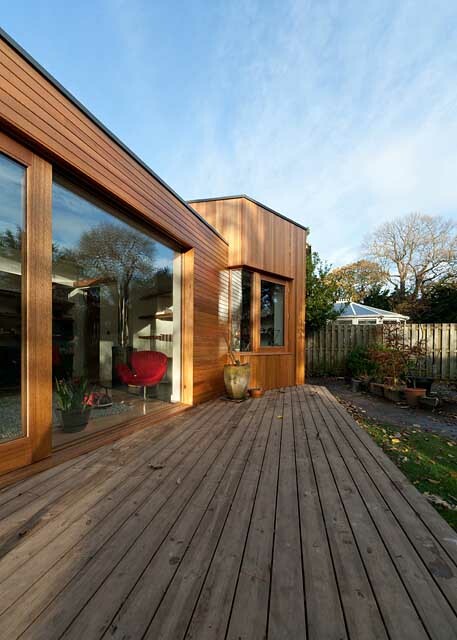 The extension is clad in FSC Certified Western Red Cedar. The roof is finished in a dark grey Sarnafil membrane to match the existing roof. The windows and doors are Meranti. Careful consideration was taken so that the neighbours are not overlooked but still maximises the views from the extension to the garden and woodland beyond. The staggering of numbers 18 and 19 means that the new extension sits almost entirely behind the rear elevation line of the neighbours. 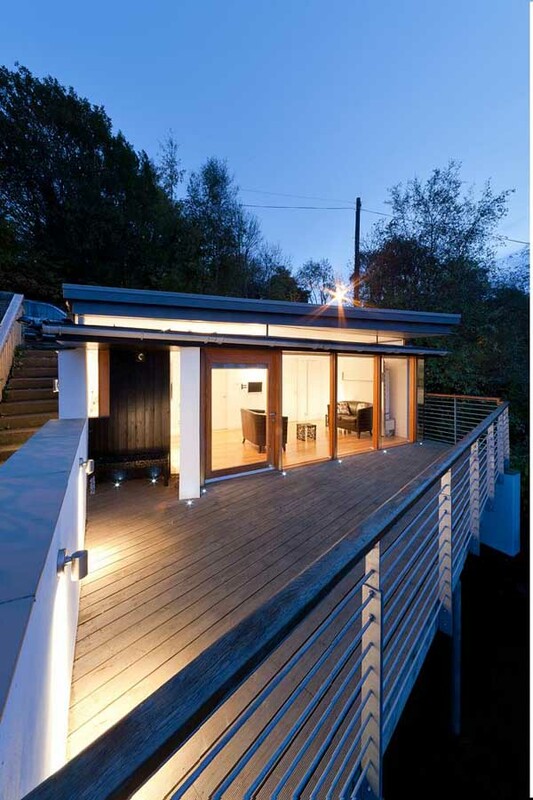 It is not very often that architects get the chance to work with clients who have the desire and vision to commission and push for something special, let alone have the confidence and passion to see it through to completion.